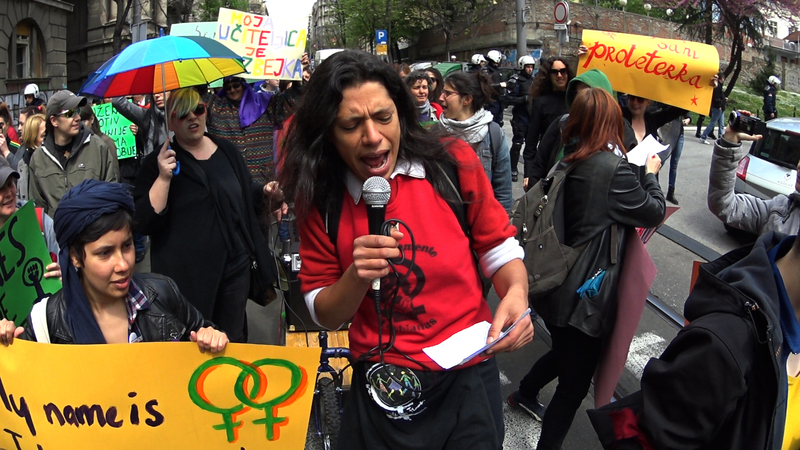 Feminista is a feminist road movie, a journey to the heart of global feminism. In 2015, Myriam Fougere joined a group of young activists who had formed a caravan to travel across twenty European countries – from Turkey to Portugal, by the way of the Balkans, to Italy, Spain and Portugal. Revealing how this new breed of politicized women inhabit their personal lives, Feminista documents how a dedicated international group of caravan dwelling young feminists traveled across a myriad of miles and territories to unite forces with other women. Fighting oppression, participating in local political gatherings, supporting homegrown local feminist activists, we watch face-to-face encounters and experience how understandings of local struggles build alliances of support. As a breath of solidarity, Feminista provides a rare glimpse into a widespread feminist groundswell movement, possibly one of the largest least understood and unrecognized mass political movement that is very much alive throughout the world today. Toronto International Independent Film Festival, preselected.